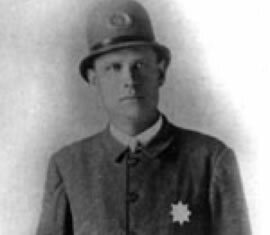 Officer Manzel was shot to death during his first shift after returning to the police department from a three-year separation to work in the war industry. While investigating the burglary of a business, Officer Manzel encountered two suspects. He was escorting them to their lodging when he was shot in the back of the head with a .32-calibre pistol. A suspect was arrested, tried, but acquitted of the murder charge. He served three years for the burglary and was deported. Ironically, Officer Manzel’s return to the police department was as a replacement for an officer arrested and sent to prison for burglarizing the businesses on his beat. Survived by his wife and three children, he is buried in Ogden City Cemetery. Officer Manzel’s bronze memorial plaque is sponsored by Ogden City Corporation. MY GREAT GRANDFATHER I NEVER KNEW, BUT THE STORYS I HAVE HEARD, I FEEL I HAVE KNOWN HIM MY WHOLE LIFE. I AM PROUD TO SAY THAT I AM HIS GREAT GRANDDAUGHTER, AND HE WAS AN HONEST GREAT MAN THAT SERVED AND DIED PROTECTING OUR COMMUNITY. A man I’ve always heard about from his daughter down through his great grandson Lee Jensen. I am honored to be following in his long, almost lost, foot steps and serving as a policeman myself. Great great granddad I am proud to have had you as an ancestor. I am one of Charles Manzel’s great-granddaughters, as well. His daughter, my Grandma Josephine, was only 17 when he died. She was a wonderful woman. She made sure to tell her seven children about her father, so even down to today, there are very many of his descendants who know not just his name, but about the man himself. I am grateful for this.